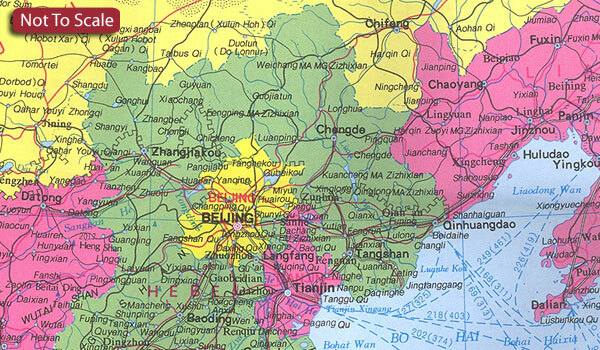 Administrative Map of China at 1:6,000,000 from the Beijing based China Cartographic Publishing House showing the country’s provinces in bright colours. All place names are given transliterated into Latin alphabet. An inset shows the area of the South China Sea claimed by China. Each province is shown in a different colour, with town symbols indicating their administrative status. The map shows the network of main road and rail connections. Also marked are coastal and international ferry and shipping lines. The base map, in addition to showing rivers and main lakes, also indicates deserts and swamps areas, plus gives names of main mountain ranges, peaks, etc. The map has latitude and longitude lines drawn at 5° intervals. Map legend is on English. 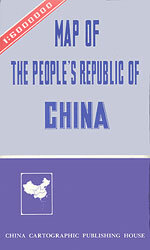 Current edition of this title was published in 2002.